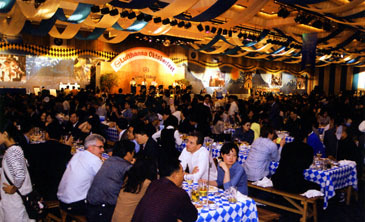 This September the Millennium Seoul Hilton will host their eighth annual Oktoberfest. 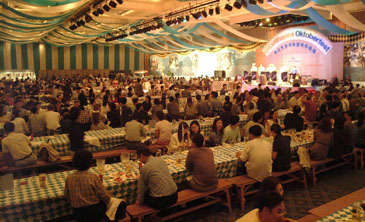 It is the largest celebration of beer and Bavarian cuisine in Seoul. Get out your lederhosen, and dust off the accordion, it is time once again. Germany's largest festival originated from the 1810 royal wedding of the Crown Prince Ludwig and Therese of Saxony-Hildburghausen. Being a special day the King decided the celebration should be a state fare, and invited the town to celebrate with him. 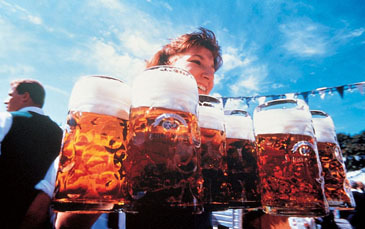 The festival continued every year, morphing into today's Oktoberfest. Almost 200 years later, both nationals and foreigners continue tourists flock to Munich to celebrate. Dozens of countries from Japan to Brazil put on elaborate festivals of their own. Last year the Hilton played host to 3,500 guests. "We are expecting the same figure as last year," said Assistant PR Manager Yong-Deok Kwak. "More and more people are coming through word of mouth, and because the word Oktoberfest has become very popular in Korea. When we started eight years ago this was a new concept, even to the expats, but now many people know about our event and look forward to it each year." The event takes between six to eight months to plan. Organizers take every step to create authenticity. "It really looked like an authentic beer tent," said Kevin Crowe of last year's event. The hotel's spacious Convention Center is overhauled into a gigantic beer tent, including picnic tables covered in festive checkered table cloths, landscape murals of Germany, colorful ribbons, and hotel staff dressed up as Bavarian beer maidens passing out cold steins. A true Oktoberfest wouldn't be complete with out live music, and every year the hotel flies over a band from Munich. This year the Bavarian band Muencher Zwietracht will have everyone from professions to diplomats, to locals are on the dance floor flapping their wings to the "Chicken Dance." It is a strange thing, but judging from last year's event people love to dance to polka. "It is the fun of it," said organizer Mario Habicher. "Polka has a certain rhythm that affects people. It gets in you, and then you just start dancing." In addition to dancing, games like arm wrestling for both men and women are held on the main stage. While women's arm wrestling isn't exactly traditional, the crowd always gets a kick out of the women contestants. Many of who look very lady like and petite. "If we only create games for men there becomes separation," said Habicher. "We want to have fun for everyone." Winners take home fantastic prizes including, restaurant vouchers, and gifts from sponsoring companies. For prize seekers who would rather watch than participate, raffle tickets are sold throughout the night. Last year the grand prize was a complementary round trip ticket from Seoul to Germany. Admission not only gets guests all the free flowing ale they can guzzle, last year's average was four liters per person, also a seeming endless buffet of authentic Bavarian food. "80 percent of our guests are Korean so what we try to do, especially this year, is to create a menu that shows traditional German cuisine, but also appeals to Korean taste," said Habicher. The Hilton is widely known as one of the top hotels for dining, thanks to their signature French restaurant Seasons, and award-winning chefs. Gastronomic treats like real sauerkraut, schnitzel, sausages, roast lamb, chicken, cheeses, salads and more, are on offer all night. "Our Korean chef knows the German menu and the Korean palate, and works with both to create the menu," said Habicher. Ms. Mary Crowe is a freelance writer living in Seoul. She covers food and wine events, and bar and restaurant reviews for various websites and magazines in Korea.